I’m a little slow in noting this, but last week marked three months since then Cardinal Schonborn, cardinal archbishop of Vienna, suggested that it might be time for the Church to rethink its stance on homosexual relationships, considering the quality of the relationships, rather than simply the “acts”, which is the sole focus of the Vatican document, “Homosexualitatis Problema” (“HP”). This seemingly obvious, eminently rational suggestion is nevertheless so out of kilter with the official stance embodied in HP that I have been waiting and watching carefully for any sign of refutation or repudiation, but there has still not been anything of the sort. Cardinal Schonborn has had a meeting with Pope Benedict, specifically to discuss his criticisms of the curia and Cardinal Sodano, which had been made on the same day as the observations on homosexuality and divorce – but there his been no indication that the issues around sexual morality were even discussed. Where I was expecting to find voices from within the Vatican, or from diocesan bishops, raised against Schonborn’s statements, I have still not seen reports of even a single bishop openly disagreeing – and I have been looking. Instead, in the months since his original remarks in Vienna, I have read reports of three bishops who have said much the same thing: Bishop Francis Quinn, (California), Bishop Januario Torgal Ferreira (Portugal), and Bishop Willie Walsh (Ireland). There are other signs of a bubbling movement towards reform. Just this morning, my email inbox brought me news of two developments. The Irish Times last week reported on a new movement for reform launched by a group of Irish priests, while my own local bishop, Kiearan Conroy of Arundel & Brighton, is reported in the Catholic Herald to have “criticized” Pope Benedict’s new council to re-evangelize the West. (I will have more on both of these later. Meanwhile, there are also increasing signs of open defiance of authority, from parishes like St Mary’s Brisbane, or St Stephen’s Minneapolis, or the “faith community” of Mary Magdalene in San Diego, simply going their own way; to the Womenpriests Movement simply ignoring the official ban on ordaining women, and the accompanying threats/ promises of excommunication; or the longer established groups of Catholics not acknowledging the authority of Rome, which are now attracting increasing attention. At the same time. to judge by the direct actions and statements of the Vatican, you would see a clampdown on dissent and a tightening of central authority, most clearly exemplified in the recent document which on the one hand promises automatic excommunication for those even “assisting” in women’s ordination, and on the other encouraging local bishops to apply their own strict disciplinary measures to control dissenters. Once again, I recall my time in South Africa, and specifically the final 10 years before Mandela was released and apartheid brushed aside. There are remarkable parallels, which leave me more convinced than ever that fundamental reform of the Catholic Church is surely on the way: only one question remains to be answered. The story of apartheid was on of ever-increasing enforcement of racial segregation in every area of South African life, and an accompanying expansion of “security’ legislation to counteract the growing resistance, and the perceived dangers of attempts at violent overthrow of the regime. However, there came a point, somewhere around the seventies, that simple economic forces began to force a relaxation of the regulations in some areas, notable on employment restrictions initially, and then on some of the minor social restrictions. Then, some concessions were made which allowed for a modest degree of integration of school education. In other areas of life, people were finding creative ways to simply circumvent the law, particularly on residential segregation. For example, I helped my secretary to buy a house in the wrong “group area” by the simple expedient of setting up a business entity to buy the property in the company name, and installing her and her family as “tenants”. I was nominally the indirect owner through the company, but in practice I paid nothing into the property, and got nothing out of it. All correspondence for the property was addressed to me as “company” proprietor – but at her address, so de facto, she and her husband were full owners. The whole operation was totally illegal, but was being done on such a wide scale, that the authorities simply lacked the political will to prosecute, when there were far more pressing issues to deal with. So the number of people openly flouting this law, like so many others, simply increased, until it was obvious that the law would have to change. The great paradox during those final 10 years was that while there was a gradual easing of restrictions in the social and economic realms, there was a tightening of security legislation. Politically, open resistance had been growing steadily since the 1976 township youth riots, and violent opposition was ever more evident. 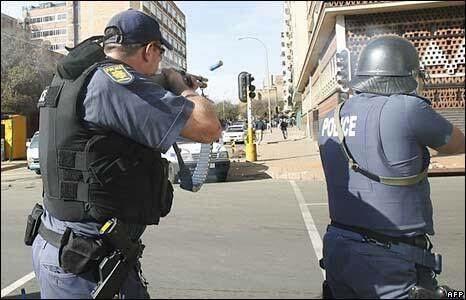 There were bomb attacks in the city centres, there large scale boycotts and strikes to commemorate major dates in “struggle” history, and violent enforcement in the townships of the tactics decreed by unofficial local “street committees”, or penalties and reprisals on those who were believed to be in support of “the enemy” – the police forces. In an attempt to keep a lid on the violence and dissent, the reach and powers of the police and military “security” establishment were being constantly extended. And so it seemed. right up until the very end, as if things were getting inexorably worse, and we were headed for unavoidable revolutionary conflict. Then suddenly, President Botha handed over his premiership to FW de Klerk, a fresh (White) election was called, and within months the exiled nationalist movements were unbanned, Nelson Mandela and other leaders were released, and apartheid was consigned to the garbage bin of history. Where are the parallels I see for the church? Next, you have some (unofficial) relaxation and backpedalling of the official positions on some issues. In the church’s case, this does not mean that official teachings have changed – just that in some cases, tactical silence from the top, and tacit acceptance from clergy at the coal-face, have contributed to Humanae Vitae being so generally ignored. There has also been a widespread acceptance of increased informality in the church, from styles of dress to Mass to relationships with the clergy. So, on the small issues that correspond loosely to South Africa’s “petty apartheid”, there has been a gradual easing of restrictions, from both sides of the clergy /laity divide. It is on the higher profile issues that things become more interesting. The Vatican has been uncompromising in its refusal to even discuss the key questions of women’s ordination and compulsory clerical celibacy – and those affected are simply ignoring directives. This is most spectacular on women’s ordination, but also applies to celibacy. It is likely that there were always priests who did not keep their vows, and there are still many who do – but I suspect that there are today fewer who try to keep their sexual lives secret, and an increased number who conduct their relationships with a degree of openness. There are also an increasing number of people and clergy within the church who are willing to disagree or dissent, and to do so publicly. It is this open dissent that the Vatican is now attempting to squash, in a manner comparable to the increased use of force in South Africa to stamp out resistance, just as there was a loosening of restrictions on the minor matters. However, the SA government found then that they had simply lost the ability to control those who refused to co-operate in their own oppression, and the Vatican will surely find the same thing. The only real control they have over us is in our minds. Unlike a police state, they do not have tanks, guns or prisons to control us. The power of the church has always been in their capacity to get into our heads and rule our consciences. That power they are losing. The more they attempt to dictate compliance by simple decree, or by silencing awkward critics on their payroll, the more they will lose control of those minds – especially since their own moral stature has been so badly compromised the abuse crises. I have become convinced that deep-seated reform of the Church is on the way, and that, as in South Africa, it could easily arrive sooner and more suddenly than anyone now expects. The one open question I mentioned above? While the change be introduced and managed smoothly, from above (but in consultation with the rest of us – or will it be seized, piece-meal, in a protracted splintering of a second Reformation? (Note: This site is a selective mirror of posts from my main site, Queering the Church, and some specialist satellite sites. Comments here have been disabled. To place a comment, or to read the full range of posts and features of the main site, go to the corresponding post at my main site .